Attacker hit Jewish man on the head repeatedly while shouting 'death to the Jews! '; he was arrested. 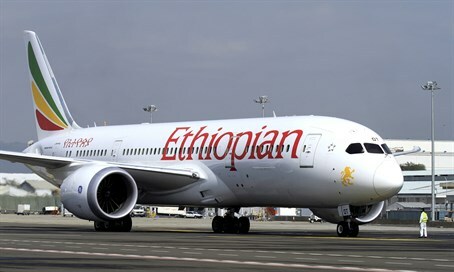 An Israeli man was violently attacked by a Sudanese national aboard an Ethiopian Airlines flight to Addis Ababa last week. In the incident last Thursday, the Muslim attacker reportedly took a metal tray, grabbed the Jewish victim's head and hit him repeatedly while shouting "Death to the Jews!" The Israeli Foreign Ministry told Arutz Sheva that Ethiopian police arrested the attacker as soon as the plane landed, and have extended his remand in custody. Ethiopian officials are keeping their Israeli counterparts regularly updated on the progress of the investigation, the Ministry added.